Hillside village is a small village of private houses, providing 24 hour security and a communal swimming pool. This 3 bedroom, 2 bathroom home is available fully furnished . The master bedroom features a private en-suite bathroom. Located on the East side of Pattaya, just 10 minutes drive to Tesco, Jomtien, or downtown Pattaya. 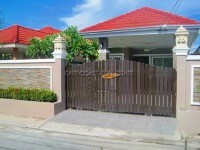 Offered for sale or rental with a minimum 12 month rental contract, and 2 months rental as security deposit.